Today’s news and images of ISIS burning Jordanian pilot Moaz al-Kasasbeh to death in a cage comes just days after the group decapitated a second Japanese hostage. Such horrific murders provoke, shock, and dismay, which is their goal. By combining medieval brutality with twenty-first century social media, ISIS seeks the largest possible amount of attention for itself and its distorted variant of religio-messianism. Such incidents require a more vigorous military, as well as messaging, response. The United States can intensify the role it has been playing in leading the coalition. But it is incumbent on senior religious figures indigenous to the Muslim world to counter ISIS’ narrative. Holding Kasasbeh hostage had helped provoke a limited backlash against Jordan’s participation in the U.S.-led coalition against ISIS. Prior to the news of his murder, some of Kasasbeh’s Bararsheh tribesmen protested in Amman againstKing Abdullah and his decision to participate in the anti-ISIS campaign. Such demonstrations, particularly amongst tribesmen, are unusual in Jordan. In its barbaric killing of Kasasbeh, ISIS hopes to drive an even greater wedge between Jordan’s Hashemite rulers and the small but not insignificant number of Jordanians sympathetic to ISIS, or at least opposed to Jordan’s fight against it. With Jordan now hosting over half a million Syrian refugees, there is considerable unease and conflict fatigue in the Hashemite kingdom. Employing their media savvy, ISIS released the images of Kasasbeh’s murder the same day as King Abdullah’s visit to Washington, even though the Jordanian pilot had apparently been murdered a month ago, according to sources in Amman. ISIS no doubt wanted to drive home the image of the Western-backed Abdullah being received in the capital of the coalition’s leader. Not wanting to play into this narrative, King Abdullah immediately cut short his visit to return back home. Upon return, he will likely rally the vast majority of Jordanians outraged by the murder of their pilot and take strong measures against incarcerated accused terrorists. ISIS knows and expects that. 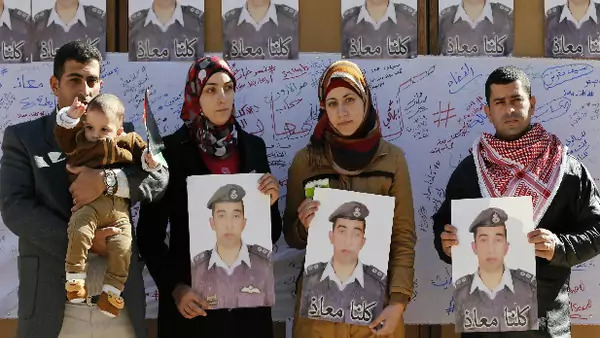 But ISIS nonetheless hopes its defiant gruesome murder of Jordan’s pilot, like the beheadings of other ISIS prisoners, will make some Jordanians question their country’s military support of the U.S.-led coalition and suggest that its participation is not worth the cost. ISIS calculates that provoking anguish and anger amongst its enemies will help generate new friends and recruits, or at least weaken the resolve of its adversaries. King Abdullah will doubtlessly try to prove this notion mistaken. ISIS is seeking to project an image of itself as fierce. Such tactics could successfully distract attention from the significant battlefield setback that ISIS has just suffered at the hands of Kurdish fighters in Kobani and elsewhere. Yet ISIS’ projections of fierceness are not just a contrivance. ISIS’ capture and control of Mosul and large chunks of Syrian and Iraqi territory last June demonstrate the very real military power at its disposal. But it adds, as an ideological force multiplier, its brand of Islamist ideology. That ISIS poses an ideological threat well beyond the battlefield suggests that the U.S.-led coalition’s reliance largely on air-power is too limited. Sure, determined Kurdish fighters were successful in countering ISIS on the ground in Kobani with coalition support, but only after a protracted and deadly fight. Similar fighters prepared to challenge ISIS on the ground in Iraq and Syria appear sorely lacking. But the ugly murder of Moaz al-Kasasbeh demonstrates that the anti-ISIS coalition needs a robust strategy to battle the Islamist forces on the ideological as well as the military battlefield.